Why Mindful Eating for Kids? Trying to understand the latest nutrition information is confusing. There appear to be heaps of foods and chemicals to avoid, leaving very little left to eat! If you aren’t sure what to feed your family, join me in learning about nutrition, specifically macronutrients! What is a macronutrient? The easiest way to identify a macronutrient is to see if it contains calories. Before you roll your eyes and think OMG another list to memorize, please know that there are only four macronutrients! If you are trying to remember what these mysterious four macronutrients are, let me help jog your memory: carbohydrates, fat, protein, and alcohol. These fabulous four macronutrients provide your body with 100 percent of your energy needs. If you are feeling a dip in your energy before or after eating, consider playing with the balance of your macronutrients. It breaks my heart when my families are told to follow a plan that is laced with guilt, shame and fear. Mindful eating offers, a gentler approach, which begins by understanding no one is “perfect.” We are all trying to find a balance between our wants and needs and our all-too-human cravings. If you and your family are ready to break free of the restrictive eating cycle, join me in learning about mindful eating and macronutrients – sign up to receive more blogs about mindful eating and nutrition. Having a choice is at the heart of mindful eating, and the ability to choose creates autonomy, independence and confidence around food and eating. How can such a seemingly small thing have such a big outcome? Choice is asking you to check in and learn, “Why am I eating this food?” You are no longer passively receiving food but actively choosing it! The benefits of having a choice don’t stop there. Asking questions stimulate learning, allowing you to adapt, change and modify a situation based on your needs. The next time you decide to eat, ask yourself, “Why?” Why am I choosing this food instead of that food? You may begin to see patterns or start to uncover something deeper about your motives, which is great. However, if this idea of asking “Why?” has left you feeling empty with a sense of having absolutely no clue, don’t despair. Most decisions regarding food and eating can be divided into two groups: internal and external cues, triggers or reasons. Internal cues are information that only you know. This would include influences like hunger, fullness, likes, dislikes, preferences, attitudes and memories or associations. External cues are information that is known by everyone or obtained from outside tests and measures. Typically, if you need a machine or a tool, it is considered external information. Examples of external influences include clocks, food labels, blood sugar or cholesterol levels, temperature, or portion size. All of these examples need some sort of tool or device to obtain the data. External information can also include other people, environment, and atmosphere. Resist thinking that one of these groups is “good” and the other “bad.” That binary view is not accurate and often triggers feelings of guilt, fear and shame. Instead, try to realize that food and eating choices are a blend and balance of both internal and external reasons. The key is understanding why you are choosing to eat. The moment you ask, “Why?” you are taking steps to counter mindless eating. It is amazing to realize what a person will eat, even if it tastes bad. In the book Mindless Eating, author Brian Wansink shares an example of how an external trigger, people eating popcorn, can cause someone to eat stale popcorn. Really? He did an experiment and found that if you are offered free stale popcorn and you hear other people eating popcorn, you will start eating it, even if it is gross and unappealing! The key is to check in with those internal cues to decide if eating stale popcorn is enjoyable. Being able to stop eating something that tastes bad, like stale popcorn, may not seem like a huge skill, but it really is. Mindful eating works by asking you to “check in.” Sure, you might be triggered to taste the popcorn, but you don’t have to keep eating it if it isn’t enjoyable. This is because you have the choice, and at any point you can ask, “Why am I eating bad-tasting, stale popcorn?” What is driving this choice? Kindhearted curiosity will help you explore and understand the reason for choosing food. Continue asking these friendly, gentle questions to help yourself see the choice in every situation. “Am I still hungry or am I feeling full? Never missing an issue of Mindful Eating for Kids is easy when you sign up to get the newsletter! Spice up the Curiosity at Home! The first of the four tools that will help your children become happy, healthy eaters is creating the intention to have them start Discovering new things about nutrition, food and health. When I talk about discovering, it is simply dropping the concept into the child’s thoughts. Discovering begins with an introduction to a topic or concept. I like to think of the Discover phase as a handshake or a brief introduction. You are pairing a name, “Hi, I am Megrette,” with a face. This is appropriate for very young children. It is easy to forget that they simply don’t know things. For example, every child has to discover what a vegetable is. It is easy to forget that a child doesn’t know. In the Discover mode, you may say, “Did you know green beans are a vegetable?” You might discover if a child can name other vegetables. Maybe look at some pictures and pick out other foods that are also vegetables. When I say discover, it is recognizing that many children may not have a clear idea what is or isn’t a vegetable. Kids are natural at discovering things, and it can be a fun game to go to a grocery store and ask the children to find other vegetables that they can name! I remember asking my daughter to get some fresh ginger at the store. She looked at me and said, “Which one is ginger?” This made me realize all of the different ways a child could discover something about food, such as how it tastes, or how a spice smells. The possibilities are endless if you discover together. 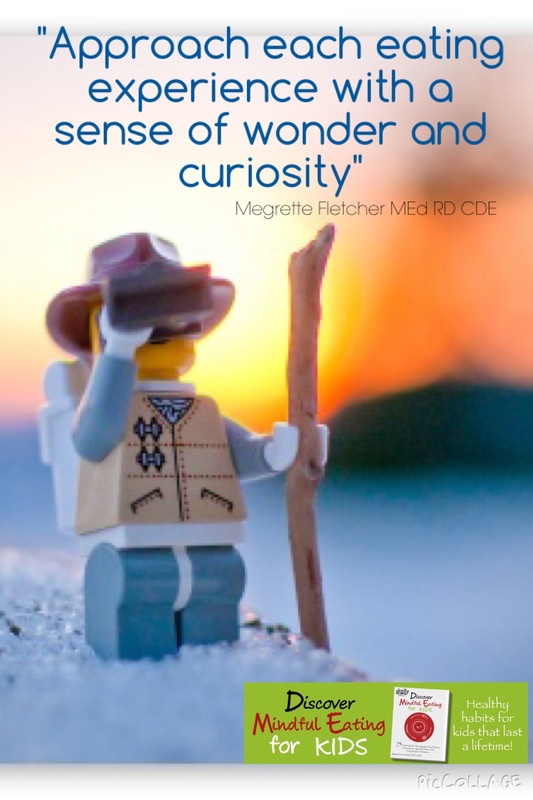 Does every child like discovering new things? No. In fact, many children are afraid of new experiences. This was the case with my youngest child. She needed to be introduced to a concept many times before it’s interesting. This reality can often be misinterpreted as “The child is not interested in these activities.” I had to coach myself first to remember there is a spectrum of curiosity that ranges from very interested to refusal, in all phases of learning. I encourage parents to remember that this is normal and that if they have more than one child, to see each child as unique. If one child is interested, it doesn’t guarantee the other child will be receptive. If the child doesn’t seem interested in learning about food or eating, don’t worry – just stay in the Discover phase a little longer. Keep finding new things to point out. Interest and motivation are two dynamic aspects of learning and behavior that have normal highs and lows. Most children need repetition for something to even be noticed. The Discover phase is an introduction to a topic or concept. It is pairing a visual cue with a name. Just as with people, sometimes we need to be introduced many times before we remember something. Many children need to be reminded and reintroduced to a topic or idea. This is a normal part of learning. Repetition is an important part of all teaching. So keeping finding ways to “Discover” with your child to generate interest in health, food and eating. Take an enjoyed entree, for example, chicken. Now ask a child to select a new flavor to try on the chicken. You can have the child smell, touch and help prepare the meal. Most children like the smell of basil, garlic, tarragon or ginger. Asian – try 1Tb fresh ginger, grated, 2 tsp garlic, minced and 1/4 tsp pepper. Indian – try 1 tsp of ground cardamon and coriander, 1/4 tsp of cinnamon, ground cumin and 1/8 tsp of cloves and pepper. Mexican – try 2 tsp minced garlic, 1/2 tsp chili power and 1/2 cup fresh, chopped cilantro. These great spice combinations were from QuickFlip to Delicious Dinners by Eileen Faughey, MA, RD. Why explore the concept of fullness with a child? The truth is, he or she may not know what fullness feels like. Really? You may wonder. Pause for a moment and ask yourself, where would a child learn what fullness feels like? Television? Magazines? Maybe his family, friends or his siblings talk about finding that right amount of food that feels comfortable but not too full? You know, that amount of food that is ‘just right’ in the stomach. Prior to a meal, introduce the child to the fullness pod image. Chat with your child about where his/her ‘fullness pod’ is. Have him point to the space just below his chest. Typically, this is two fists above the navel. Repeat that the goal of eating is to feel good when done eating. It is not to eat everything on his plate or a specific amount of food. Kids can be tricky here – often they want to avoid certain foods, (AKA foods with nutrition!) to eat foods with less nutrition. Kids will say the funniest things to stop eating a disliked food. Trust me, as a mother, I have heard it all before! When Do I Talk About Nutrient Density?